I moved to shower gel long time back. But, I still use soaps at times. First of all, they are easy to travel with - carry a smaller piece and second, they generally have lesser parabens compared to shower gel as these are water-free and less prone to germ attack. (But, try not to share and use smaller size even in shower so that you can throw them in case of any issues). Citrus: Words cannot explain how much I love citrus bath and body products. Give me orange, satsuma, tangerine, orange blossom....and I will say 'Yes' to all. The ones that top the list is The Body Shop Satsuma (Rs 225) and FabIndia Orange Neroli. I am been more biased towards the Satsuma shower gel and I have a bottle (on my 2nd or 3rd) standing in my bath shelf now. But, when I saw the 50% discount offer, I could not resist. The soap smells exactly like the shower gel. But, the champion of all is the FabIndia Orange Neroli (Rs 95). I tried it first back in 2010. I love the kick it gives in the morning. It converts me from a sleepy head to the woman ready to take over the world. I have lost count of the number of times I have repurchased this. 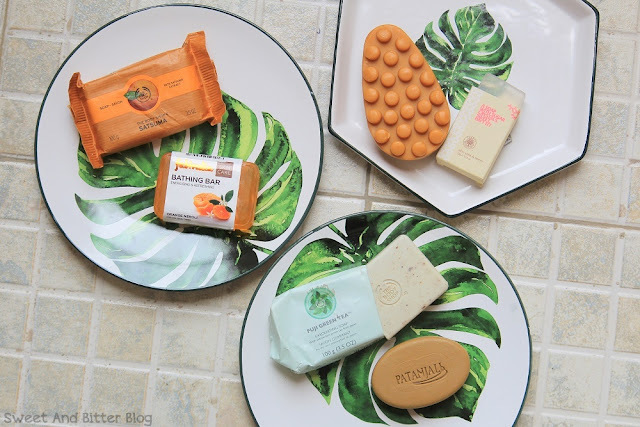 Floral: Should I mention the FabIndia Orange Neroli again because Neroli is a flower? BTW, I finally gave in and got the Neroli essential oil from a brand called Purra. I am sniffing it like a drug addict now. But, as I have to mention a floral one, my vote will without a doubt go to - Imli Street Wild Rose (Rs 160). That one is marvelous. When I got the package, I could even smell it before opening the box. The fragrance is that potent yet not headache inducing. The rose smell is pure and not at all artificial and it also has a loofah inside. You can read more here. It is out of stock everywhere and I have checked zillion time. Under honorable mention, I would say TBS Moringa soap which I tried back in 2011. But, the fragrance of the shower gel lasts much longer in the case of Moringa. 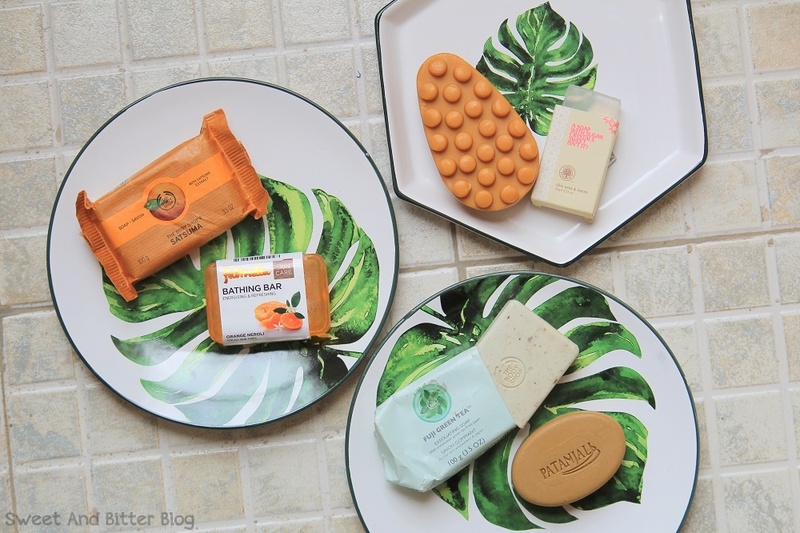 Fresh and Green: The Body Shop Green Tea Exfoliating Soap (Rs 595) wins uncontested. I am on my second one now. The biggest let down is the insane price. I have to ration its use. Cheaper options? Biotique Basil and Parsley Soap. Very soothing. Nutty: A soap so good that I tried it, worried that it is limited edition and will go off the market soon, and purchased a backup? Yes! This happened with The Body Shop Argan Oil Massage Bar. The smells calms be down and transport to a wonderland where everything is happy. Forget the massage part because the soap is creamy and you cannot put much pressure on the knobs. But, a great moisturizing soap. Exfoliating: Again, TBS Green Tea Exfoliating Soap. But, last autumn I discovered a very affordable soap which exfoliates and removes tan - for just Rs 35 - Patanjali Multani Mitti Soap. From hotel toiletries: The Forest Essential Neem Aloe Sugar Soaps. If you ever stay in Taj Hotels, stock these. Luckily, my husband stayed almost a month there last year but now I am running low. None of the other sugar soaps from The Forest Essentials even matches close to this. If you have ever used it, you will agree. What are your favorite soaps? PS: I am sure I must have missed something. I will add them later.